"An RV Rental will help you take the road less traveled?" Have you ever wanted to take a vacation where you could fly by the seat of your pants? Go where the wind takes you? Stop and smell the flowers? How about renting an RV and taking the road less traveled? With an RV you can have your bathroom, your kitchen, and your living room right along with you so you can stop wherever you like and take time out. Here are 5 great tips to remember when renting an RV. 1: Size - When choosing which size RV to rent you will need to take into account not only the people traveling with you, but the luggage and activities that you have planned. While the world is definitely your playground, remember that you will still need enough space for everyone to sleep comfortably or to be inside during extended inclement weather. While no one plans for rain or snow during their perfect vacation, take into account that it probably will happen and you may be stuck inside for a period of time. How many comfortable seats are there and does that leave room for playing board games or putting together puzzles? RV's come in many sizes from towable pop-up campers to full sized motorhomes, take a look at the different sizes at local RV stores or shows to determine what will best fit your needs. 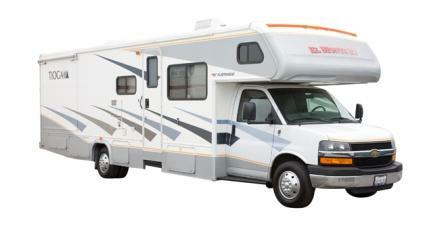 2: Cooking - Determine what type of cooking you generally do on vacation and be sure that your RV has that capability. If you plan on making a casserole for 5 people, is the oven big enough for a casserole dish? If you usually like hot side dishes, how many stove top burners are there? Does the RV come with pots, pans, and utensils or do you have to pack them along? Also, what are the sink capabilities? Will you be able to wash your dishes or will everything need to go on paper plates? If so, this may limit the items you will want to cook. What size is the fridge? Will you need to stop every day to reload or is there extra storage for canned beverages that can be put into the fridge as needed? Making your own meals and buying in bulk can save you a lot on a trip if you have the storage capacity in your RV. 3: Cost - Planning your trip in an RV will call for specific cost analyses as would any trip. Where will you purchase groceries along the way? Creating a list of grocery stores along your route can help you when you are in need of quick supplies. What is the current cost of gas? Planning in advance approximately how many miles you plan to travel will help you budget your gas money. What is the cost of the rental? Does the rental company charge extra for mileage or is that included in the cost of the rental? Most companies include mileage, but be sure to verify this specifically with your rental company. 4: Parking - You may want to plan some of your overnight stops in advance, or at least have a list compiled of places that are available to park in your general travel area. Most Wal-Marts allow overnight RV parking at no cost, but be sure to check for signs because parking is not allowed at all lots. There are also many websites with reviews from fellow RVers that list the best places to park in certain states. State parks are also a great alternative overnight parking spot, and most allow for RV parking. Putting together a list of parks and their phone numbers will help you determine your overnight locations while on the road without having to scramble for a last minute parking spot. 5: Be Prepared - An RV rental vacation can be the highlight of your year with the freedom to travel the open road, but beware of possible problems. Before setting out make sure that you are aware of how to check the levels of fluids and the proper tire pressure for your specific RV. It is also wise to have on hand a list of RV repair facilities incase you should run into a mechanical problem while on vacation. When renting your RV inquire what type of maintenance coverage plans they have available and if they have specific dealers that they work with for repairs. It is also a good idea to check with your current auto insurance to see if they will cover a rental car incase of an out of state mechanical problem while on your vacation. Most insurance companies have rental coverage available if you have paid for it in advance. If you plan to travel a long distance you will also want to know what the maintenance intervals are for that specific RV incase you will need to have the oil changed or tires rotated during your trip. With any trip, proper advance planning can make your trip enjoyable and problem free. Asking the proper questions before you start will help to prepare you for any possible problems that should arise. Renting and RV will allow you to take a trip into the great wide expanse at your own pace, so live a little, relax a little, and see the country. Who knows what fantastic memories await you out there!